After Diane, Dave and I had our morning walk, I went to town looking for a delivery of my replacement inverter for my Prius Campervan. 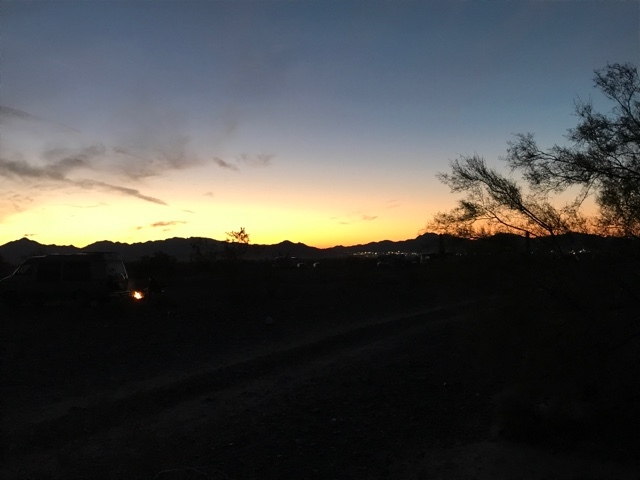 Quiet Times in Quartzsite, where you can ship items to yourself, charges $2.00 for packages they receive for under 50 lbs. Although Amazon said it delivered my package Saturday it was not there as it is believed to still be in the Post Office. Since today is Martin Luther King Day I'll go back tomorrow to pick it up. Before I left camp I got an offer to hike a trail about 45 minutes south. It was not a long hike but it was interesting, as I was going to get to see some of the last palm trees natural to AZ. In agreeing to go on the hike, I decided to pass on all RTR activities / seminars for the opportunity of exercise. Above is the mountain that harbors the Palm Canyon, that we were going to hike. 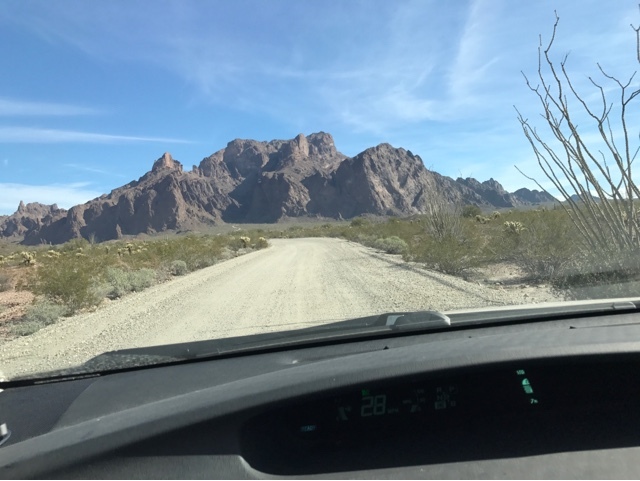 The dirt road to the canyon is 7 miles long off AZ 95. There is a good size parking area at the trailhead that also offers Primative camping. 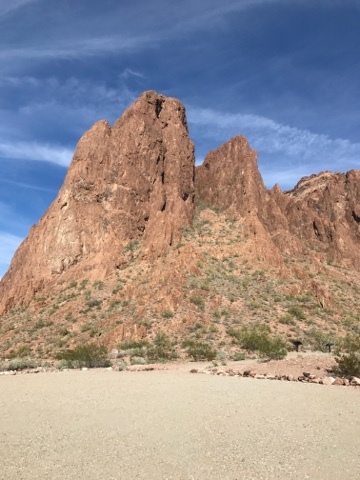 The Palm Canyon Trail is in the Kofa National Wildlife Refuge. Below is a link to more details of the area and the trail. 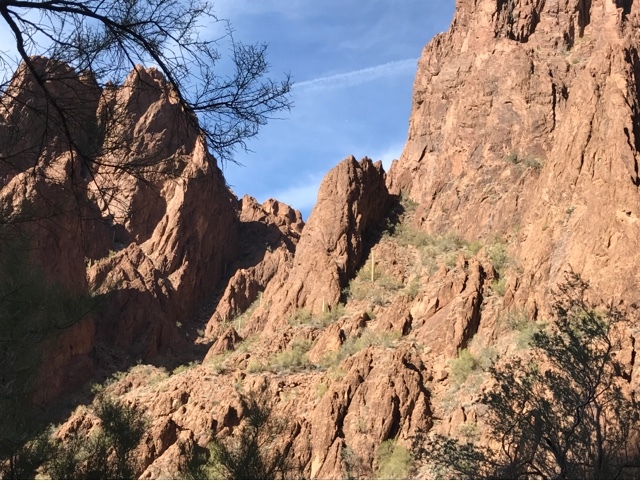 The first half of the hike is relatively easy, while the second half involves climbing over and around large rock with trails full of rubble rock. The further you go the harder the climb gets and the higher in elevation you ascend. 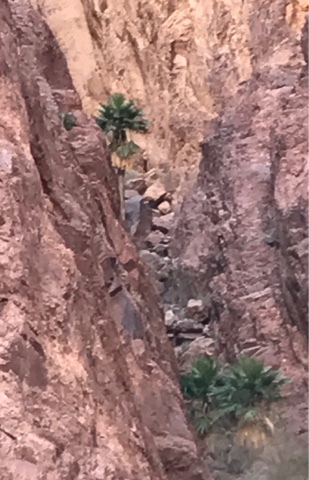 Above you can see these California Palms tucked in the crack of the canyon off the side of the main trail. 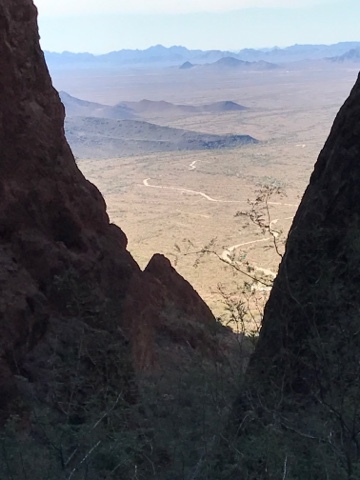 This picture gives you the look out of the canyon nearly at the end of the trail. The elevation gives an excellent view of the 7 mile road coming in. 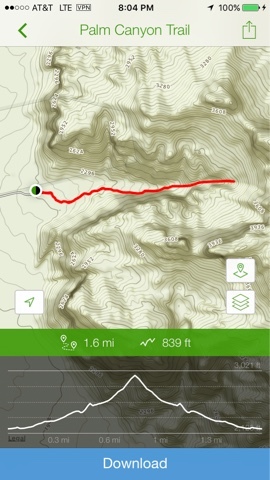 I recorded my hike on AllTrails but messed up not turning off the record before driving away so this is an archived file off the app. It was an excellent hike with decent elevation gain to get a workout. 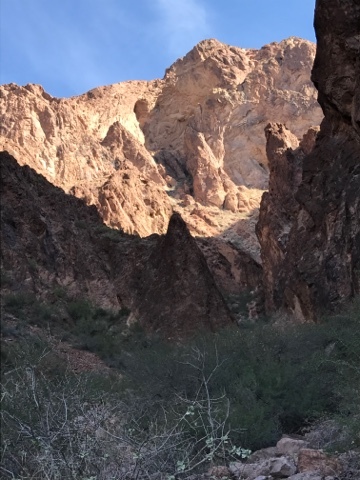 The upper part of the trail is moderate to hard with the need to climb using both hands in places to scale large rocks. Upon returning to the RTR it was time to make my hot water for tomorrow and store it in my 24hour Thermos. Then it was time for dinner. Tonight I made rice, pees, and chicken in my rice cooker. It made enough so I have some for tomorrow too.